The most infamous gas chamber began to function in the Auschwitz extermination camp in 1941 (Brugioni & Poirier 15). It resulted from a need to kill large numbers of people in a very limited amount of time. The gas chambers were built to process 12,000 prisoners a day (Brugioni & Poirier 20). “The prisoners ‘sent to the left’ were deceived into thinking they were going to be showered and disinfected” (Brugioni & Poirier 20). Once they had undressed and were crowded into the chamber, Zyklon-B was introduced (Brugioni & Poirier 20). After all the prisoners had lost consciousness and died, their bodies were then brought to the crematorium and burned (Brugioni & Poirier 20). The remains of the original chambers at Auschwitz-Birkenau, once the camp was liberated, was rebuilt and turned into a museum that now houses various items collected from the prisoners, such as shoes, clothes, and even the cans that held the Zyklon-B granules. However, there is a group of people, Holocaust deniers, that don’t believe this was the true purpose of the gas chambers. Typically there are two different kinds of deniers: “Hard” deniers and “soft” deniers (Miller 342). “Hard deniers claim that the estimated five to six million murdered Jews were actually never killed and that the Holocaust, or at least the greater part of it is a hoax” (Miller 342). Soft deniers acknowledge that some form of atrocity took place, but they refuse to believe that there was a plan to annihilate the Jews (Miller 342). “Soft deniers try to attribute the high death rate among Jews and others to the nature of the war itself, citing factors such as disease and starvation, which themselves are sometimes attributed to atrocities inflicted by the Allies on Germany” (Miller 342). Despite the level of denial, there tends to be a common belief among deniers that there are a lot of misconceptions that surround the gas chamber myth. To offer insight into the thought process of a ‘Holocaust denier’, I will be presenting photographs that depict the role of the gas chambers in the Holocaust, along with the historians account of what is being shown in the photo. It is important to note that this account is parallel to the function and purpose of the Auschwitz gas chamber stated above. I will the show the deniers’ interpretation ripped right from The Rudolf Report. Written by Germar Rudolf, pictured above, a German chemist and self-proclaimed “chemical and technical expert on the gas chambers of Auschwitz”, The Rudolf Report looks at the technicalities and mechanics surrounding the gas chambers and strives to disprove the eyewitness and historian accounts of their function generally accepted by the public. He is a frequent author in The Journal for Historical Review, a journal that dedicates its publication space to attempting to unveil supposedly incorrect interpretations in history such as the “Holohoax”. He is one of the founders of Holocaust ‘revisionist theory’. Revisionists look at history and based on evidence, new or otherwise, attempt to retell the story based on that evidence. Holocaust deniers ARE NOT revisionists; they attempt to reshape the story IN SPITE of evidence. They refer to themselves as revisionists and have established the journal in an effort to establish themselves within the academic society. The deniers’ feel that the Nazis were extremely thorough. They had pictures from every checkpoint along the road of the Jewish peoples’ suffering. “No photographs exist showing anything resembling such a group-gassing procedure” (Kollerstrom). The claim is that there are a multitude of photos showing groups of people piling into “gas chambers”. There are vast amounts of photos showing piles of dead bodies on the other side of the “gas chambers”, but none show the recently suffocated bodies inside the gas chambers ready to be cremated (Kollerstrom). 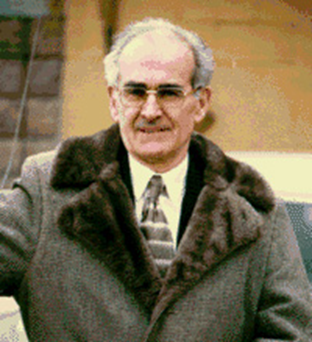 Robert Faurisson, pictured above, is a French academic and was the first to publicize and emphasize the importance of the blue prints of the crematoria and morgues (“Robert Faurisson”). He was also one of the first people to question the function of the gas chambers (“Robert Faurisson”). As another denier, Faurisson, also challenges historians saying, “Show me or draw me a Nazi gas chamber! Stop giving me words. Stop showing me a building, a door, a wall or, sometimes only hair and shoes. I need a full picture of one of those fantastic chemical slaughterhouses. I need a physical representation of the extraordinary weapon of an unprecedented crime. If you dare to say that what tourists are shown in some camps is, or was, such a gas chamber, come on and say it …” (Faurisson). The reason it is so easy for them to doubt the gas chambers function and existence is that there are no photographs or videos of them actually playing the role in the Holocaust that historians claim they did. This allows the deniers to pick apart the account of the gas chambers, with little evidence to contradict them. Why Focus on the Gas Chambers? It is my belief that the emphasis on the gas chamber debate stems from the general sense of disconcertion caused by the industrialization of death. The more the historians focus on the gas chambers as a means of proving that such large numbers of Jews died in such an atrocious way, the more the opposing side has to focus on it to attempt to disprove it. Adam Jones, in his textbook “Genocide: A Comprehensive Introduction”, says that his preferred definition of genocide is “the actualization of the intent, however successfully carried out, to murder in whole or in part any national, ethnic, racial, religious, political, social, gender or economic group, as these groups are defined by the perpetrator, by whatever means ” (18). In parallel with Jones’ definition, many historians seem to emphasize the need for intent in genocide. Total acceptance of the role of the gas chambers is the full acknowledgement that there was, in fact, planned intent behind the deaths of those who were killed in the gas chambers. That means the total acceptance of the evil that mankind is enthusiastically capable of. Many become deniers because such enthusiasm for death is, for them, incomprehensible. 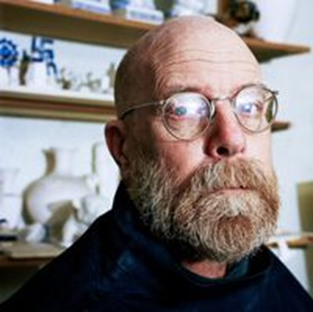 Charles Krafft is an artist from Seattle who has recently begun to put Nazi subtleties into his art (Studio 360 “Charles Krafft Interview”). Just recently he has come out about his belief that the Holocaust never happened. When interviewed by Studio 360 Krafft said that “I just don’t buy this thing about 2,000 people a day being gassed at Auschwitz” (Studio 360 “Charles Krafft Interview”) (To listen to the full interview follow the link http://www.studio360.org/2013/mar/15/charles-krafft-responds/). The gas chambers are also one of the most damning pieces of evidence against the Nazis. They are objects that we can access even today. When Nazis began destroying evidence against them, the majority of the concentration camps remained. The debate against the gas chambers also allows deniers like Rudolf to develop a very technical, detailed, dry argument which would be difficult for the general public to counteract; some may even fall victim to it, such as Charles Krafft. Pictured above is Zyklon-B. This substance is hydrogen cyanide gas absorbed by clay type granules and the gas would be released after it is exposed to air (Pressac 15). 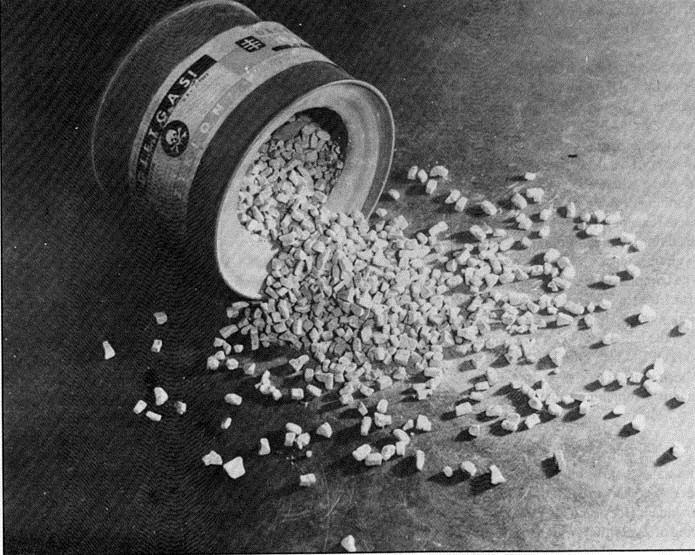 Originally used as a pesticide, historians say Zyklon-B was the poison of choice for death in the gas chambers (Pressac 16). After the Jews were crowded into the gas chambers the gases would be released and cause a slow asphyxiation (Brugioni & Poirier 20). Deniers claim that Zyklon-B was used at Auschwitz and other extermination camps, not as a means of killing Jews but as an insecticide (Rudolf 59). They claim that it was vital in attempting to maintain hygiene that mattresses be deloused (Rudolf 59). 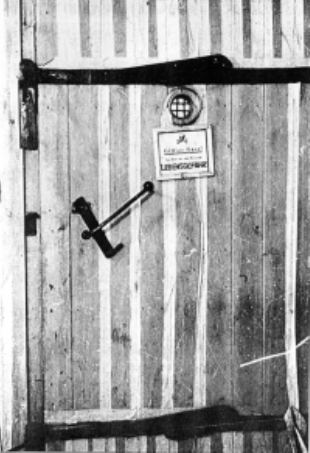 Not only were mattresses deloused but the supposed gas chambers were actually disinfestation rooms where the Jews would be exposed to non-lethal doses of the gas (Rudolf 59). In order for the Zyklon-B to be effective, the gas chambers would have to be equipped with air tight doors and windows, according to historians. Without these the gas would seep into the other areas of the crematorium and dilute to a level that lacked lethality. 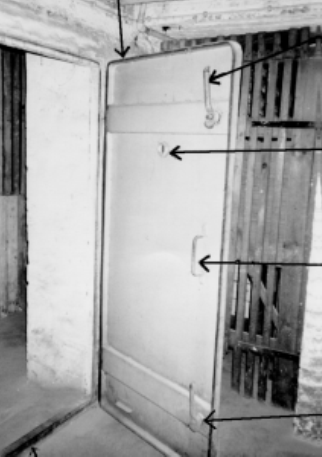 The doors also swung open in an outward direction with a place for a peephole to track the progress of the killing. Rudolf claims that the original delousing chamber doors were made with wood planks, not only were these not airtight but they would also absorb some of the hydrogen cyanide gas (Rudolf 103). These original doors allegedly swung inward, which would not be efficient when blockaded by dead bodies. He acknowledges that when the camps were discovered there were outward-swinging airtight doors (Rudolf 104). However, he said that these were added later when certain rooms in the crematoriums were changed from delousing centers to air raid shelters (Rudolf 104). To determine how Zyklon-B was introduced into the gas chambers, historians, reliant on a very crucial eyewitness account from Michal Kula, have attempted to recreate a picture of the structures (Rudolf 130). Michal Kula was a former prisoner at the Auschwitz-Birkenau camp who constructed the wire mesh pillars while working in the metalworking shop (Rudolf “Lectures” 397). 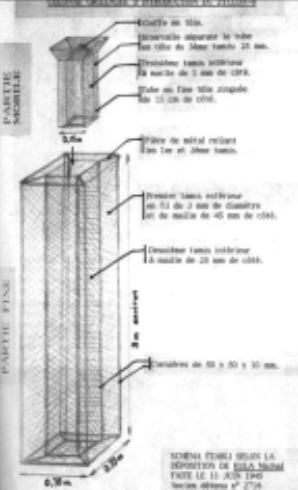 He described the device to the left, claiming it was made out of heavy wire mesh and was protruded through a hole in the ceiling adjacent to the concrete pillars that stabilized the structure (Rudolf “Lectures” 397). The pellets were poured into the top, removable part of this structure and the vapors diffused throughout the chamber below. Rudolf viciously disputes this claim, even to go so far as to accuse the witness of lying, by saying that there is no shred of documentation describing the device except that which the historians themselves have created. His first issue with the mesh structures is that they would need to be anchored into the ceiling and floor with hoop irons (Rudolf 123). The installment of such devices would be done at the time of construction, and thus, there would be tiny holes where the anchors would be put into the ground and ceiling. He says no such traces exist (Rudolf 123). Secondly, Rudolf claims that wire mesh would not be “panic-proof”. Surely, he claims, Jews who are entirely aware of their fate would do everything in their power to escape. There would need to be a solid steel barrier to keep the victims from completely ripping out the mesh columns (Rudolf 132). “A panic-proof, outer column made of massive steel, a middle wire mesh column (with no purpose at all but to hinder the HCN from spreading out), and a removable inner wire mesh column, another laborious, material as well as time consuming, and expensive task” (Rudolf 132). The actual introduction hole for the mesh pillars in the roof of the gas chambers is when the debate becomes even more complicated. Historians claim that the holes were patched up when the gas chamber was turned into an air raid shelter. Therefore the hole in the picture to the right is not an introduction hole, it is just a hole in the roof that has formed over time due to the deterioration of the structure. 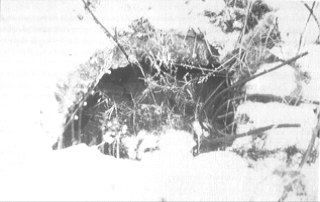 Rudolf claims that historians suggest this picture is of an introduction hole, which, according to him is simply not true. He says that steel reinforcement rods would have to run wreath-like around the supposed hole (Rudolf 123). However, he claims, all pictures of the introduction holes, including this one, show the reinforcement rods being bent backward to look as though they are in a circle (Rudolf 122). “Such holes with no plasterwork to polish off their rough edges, however, could neither have been sealed against escaping poison gas, nor against intruding soil and water, nor would it have been possible to safely install any panic-proof introduction devices in them. Using such crude holes would truly be an incredibly stupid piece of bungling” (Rudolf 125). Historians claim that once the Zyklon-B is introduced into the gas chambers via the introduction columns, the Hydrogen Cyanide will slowly dissipate into the chamber. Once it reaches a certain level of toxicity, there would be muscular convulsions due to muscle suffocation (Pressac 13). Hydrogen cyanide traps oxygen in the blood stream, which prevents it from entering the cells of the body. According to eyewitnesses, within 10 minutes the people inside the gas chambers will lose consciousness and have suffocated to death (Rudolf 215). It is claimed in The Rudolf Report that the conditions described by the historians would have required a rapid release of Hydrogen Cyanide, a rate that is impossible with all of the present factors. According to Rudolf, the amount of time that testimonies claimed the prisoners were in the chambers for would not have been enough time for toxicity to reach a deadly level because of several conditions. One main factor is the humidity that would have been caused by the massive amount of bodies in the delousing chambers, the more bodies: the more heat and moisture that is given off (Rudolf 199z). This would have drastically slowed the release of the Hydrogen Cyanide so that it wouldn’t have reached a toxic level by the time the Jews were released from the chamber. Another is the suggestion that most of these exterminations took place in the winter months. “Zyklon-B only releases gas slowly at frost temperatures” (Rudolf 204). Since publishing the report, Rudolf has been accused, tried and convicted of being a German Historical Dissident (Rudolf interview by David Duke). His doctoral dissertation was then denied, he claims, because he used the knowledge gained to obtain his doctorate, namely chemistry and physics, to compose an analysis of Auschwitz which later got him charged of a crime (Rudolf interview by David Duke). He went into exile in Britain with his wife and two children while waiting to serve jail time (Rudolf interview by David Duke). He was then divorced and now resides in the United States. He was granted citizenship after marrying an American woman (Rudolf interview by David Duke) (The full interview can be accessed here ). In America, our rights are sacred. We treasure and fight for things we feel we are entitled to, such as freedom of speech and thought. Regrettably, these freedoms allow Rudolf, unlike in Germany, to continue to pick apart the account of the historians, and in turn, slaughter the memory of those who died as a result of them. Rudolf has continued to publish books, including one called “Dissecting the Holocaust”. He speaks, along with other deniers, at college campuses and other institutions across the country. He has since continued to publish articles, magazines and books about the supposed inaccuracies surrounding not only the gas chambers but the Holocaust in general. They continue to edit and publish “scholar based” articles that work to disprove the theory of the Holocaust. They have websites; there is even a page that can be liked on Facebook. All of this is done with no repercussions whatsoever. Is there a point where the revered sanctity of our rights must come second to the preservation of the sacred memory of millions slain? Brugioni, Dino and Poirier, Robert. “The Holocaust Revisited: A Retrospective Analysis of the Auschwitz-Birkenau Extermination Complex”. Ann Arbor: University of Michigan Library, 1979. Web. Faurisson, Robert. “Jean-Claude Pressac’s New Auschwitz Book: A Brief Response to a Widely-Acclaimed Rebuttal of Holocaust Revisionism.” The Journal for Historical Review 14.1 (1994): 23. Web. 2 April 2013. Kollerstrom, Nicholas. “Jewish Holocaust or German Holocaust? Auschwitz Gas Chambers Myth”. Exposing the Holocaust Hoax Archive. 9 September 2009. Web. Krafft, Charles. Interview by Kurt Andersen. Studio 360. N.p, 13 March 2013. Web. 26 March 2013. Miller, Scott. “Denial of the Holocaust.” Social Education 59.6 (1995): 342-345. ProQuest. 19 February 2013. “Robert Faurisson”. Revisionists. N.p. n.d. Web. 2 April 2013. Rudolf, Germar. Interview by David Duke. The David Duke Show. N.P. Web. 26 March 2013. Rudolf, Germar .“Michal Kula” Lectures on the Holocaust. Web. Rudolf, Germar. The Rudolf Report. Chicago: Theses & Dissertations Press, 2003. Print.